I am not a fan of eggplant – it’s big and rubbery. (If you put the word “eggplant” into the search box at feedinggersasser.blogspot.com you get ZERO recipes out of 446) But when I saw this Graffiti eggplant at the market, it looked….interesting. So, I bought two and became a fan. I washed and cut the ends off one pound of fresh green beans. I sliced two graffiti eggplants. I put them on a big cookie pan and added 1 TBSP coconut oil. I rubbed them with my hands and spread them out. 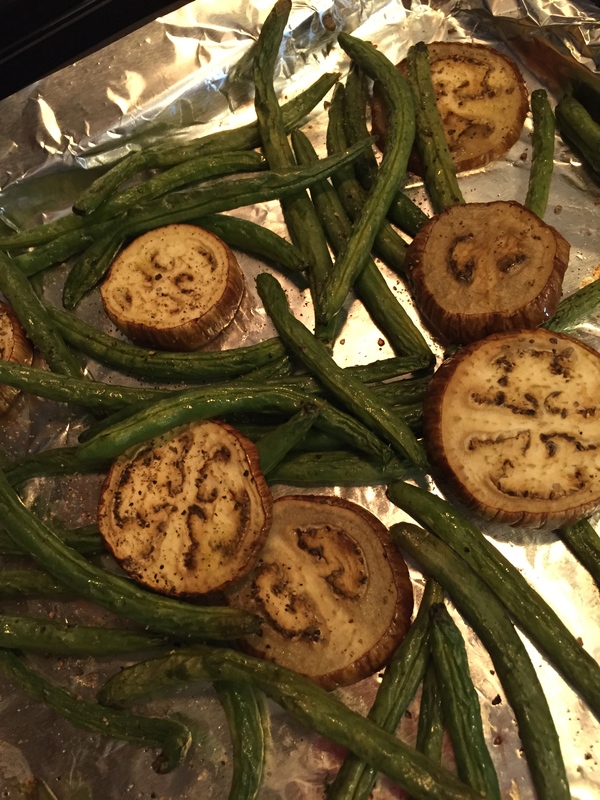 I sprinkled them with hickory smoked sea salt, freshly ground black pepper, and minced garlic. That’s it. I put them into a 450 degree oven for 25 minutes.